In principle, fiscal and monetary policy should be easy to implement. Increases in government spending or tax cuts stimulate aggregate demand and, assuming GDP is less than potential, the economy should grow. Tax cuts have the added advantage of possibly increasing aggregate supply. Expansionary monetary policy, by lowering interest rates, also increases aggregate demand and GDP. Contractionary fiscal and monetary policies operate in reverse. In practice, though, we’ve seen that fiscal and monetary policy are more complicated. Too much stimulus leads to inflation. Too much contraction leads to recession. So the question of how much stimulus or contraction is always important and difficult to determine in advance. Crowding out, sometimes but not always, reduces the effectiveness of fiscal policy. Rational expectations and Ricardian equivalence also can limit the effectiveness of fiscal and monetary policy. In the this section, we will present some further complications of real world policy. Not having a policy is not an option. As long as the federal government has a budget, that implies some fiscal policy. As long as there is a financial system, the Federal Reserve will have some monetary policy. So what is the right degree of active versus passive policy? And what is the right balance between monetary and fiscal policy? Policy doesn’t take effect instantaneously. In the real world, it can take significant time for policy to play out. We can decompose this time into several lags. Imagine that the economy starts to slow down. Recognition or Data Lag. It often takes some months before the economic statistics signal clearly that a downturn has started, and a few months more to confirm that it is truly a recession and not just a one- or two-month blip. Economists often call the time it takes to determine that a recession has occurred the recognition lag. Figure 1. 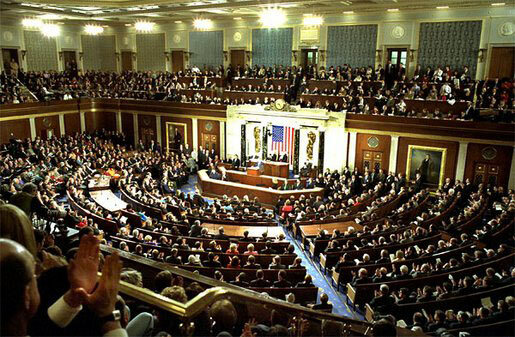 The U.S. Congress determines fiscal policy in the U.S. Legislative or Decision Lag. Once policymakers become aware of the problem they need to decide what, if anything, to do. For fiscal policy, Congress would need to propose an appropriate fiscal policy bill. The bill goes into various Congressional committees for hearings, negotiations, votes, and then, if passed, eventually for the President’s signature. Many fiscal policy bills about spending or taxes propose changes that would start in the next budget year or would be phased in gradually over time. Economists refer to the time it takes to pass a bill as the legislative lag. Similarly, the time necessary for the central bank to determine the appropriate policy response is called the decision lag. The Fed procedure involves only the Federal Open Market Committee and thus is likely to be quicker than the legislative lag for fiscal policy. Figure 2. 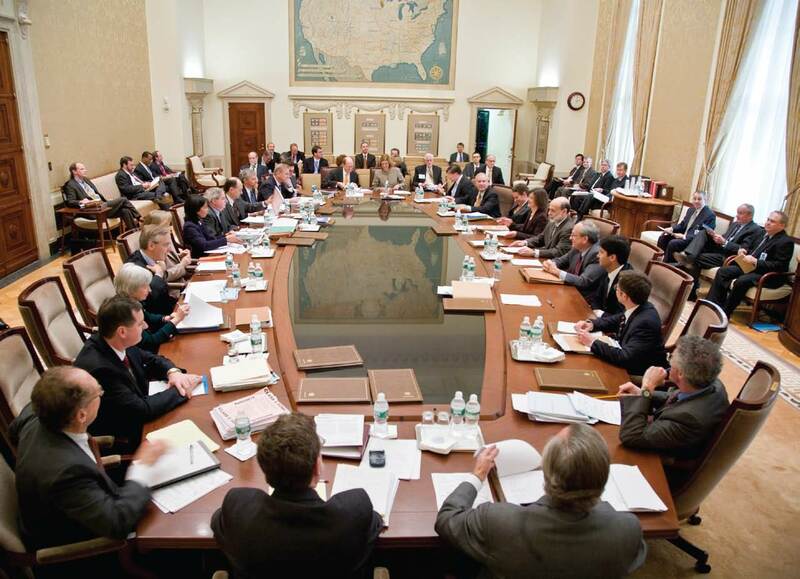 The Federal Open Market Committee determines U.S. monetary policy. Implementation or Transmission Lag. Once the government passes a fiscal policy bill it takes some time to disperse the funds to the appropriate agencies to implement the programs. Once the Fed decides on a monetary policy change, the change is implemented the next business day. Economists call the time it takes to start the projects or execute the monetary policy the implementation lag, which is somewhat slower for fiscal policy than monetary policy. Impact or Effectiveness Lag. The time it takes for the new policy to play out is called the impact lag. The change in monetary policy must percolate through the banking system, changing the quantity of loans and affecting interest rates. When interest rates change, businesses must change their investment levels and consumers must change their borrowing patterns when purchasing homes or cars. Then it takes time for these changes to filter through the rest of the economy. For fiscal policy, the impact lag may be shorter, since government agencies simply need to spend additional funds, or tax cuts appear in people’s pay checks, which they can then spend. Thus, it can take many months or even more than a year to begin an expansionary fiscal policy after a recession has started—and even then, uncertainty will remain over exactly how much to expand or contract taxes and spending. The impact lag for monetary policy can be even longer, leading to an overall lag of 12 to 24 months, or even longer. Not only can these lags be long, but the lag can be variable—longer in some circumstances, shorter in others. When government attempts to use countercyclical fiscal or monetary policy to fight recession or inflation, they run the risk of responding to the macroeconomic situation of two or three years ago, in a way that may be exactly wrong for the economy at that time. Watch this video to review some of the concerns of fiscal policy, including the crowding out effect and the policy lags mentioned above. Fiscal and monetary policies don’t always work out as planned because the tools are of varying precision. The Fed can increase the amount of reserves in the banking system, but it can’t guarantee that banks convert all their excess reserves to loans. Similarly, whenever depositors remove cash from their accounts, the money multiplier falls. Even when interest rates fall the amount the Fed wishes, that doesn’t guarantee households and businesses will increase their borrowing as much as the Fed hopes, which means that aggregate demand will not increase according to plan. Thus, for any given monetary policy action, the extent to which it has full effect depends on the responses of banks, depositors, and borrowers. These the Fed cannot control. The effect of tax cuts depends on what households and businesses do with the money they get back from taxes. Demand management policies depend on households increasing consumption expenditures and businesses increasing investment expenditures. Any given tax cut may bring about more or less additional spending. Additional government spending is perhaps the most precise form of stimulus–if the Congress increases spending by $100 billion, then aggregate demand increases by that much. But even in the case, the exact level of fiscal policy that the government should implement is never completely clear. Should it increase the budget deficit by 0.5% of GDP? By 1% of GDP? By 2% of GDP? In an AD/AS diagram, it is straightforward to sketch an aggregate demand curve shifting to the potential GDP level of output. In the real world, we only know roughly, not precisely, the actual level of potential output, and exactly how a spending cut or tax increase will affect aggregate demand is always somewhat controversial. Also unknown is the state of the economy at any point in time. When the Great Recession began to play out, during the early days of the Obama administration, no one at the time knew the true extent of the economy’s output gap. For all these reasons, discretionary fiscal and monetary policy is as much an art as a science. An additional complication to policy effectiveness is whether the policy is explicitly temporary or permanent. A temporary tax cut or spending increase will explicitly last only for a year or two, and then revert back to its original level. A permanent tax cut or spending increase is expected to stay in place for the foreseeable future. The effect of temporary and permanent fiscal policies on aggregate demand can be very different. Consider how you would react if the government announced a tax cut that would last one year and then be repealed, in comparison with how you would react if the government announced a permanent tax cut. Most people and firms will react more strongly to a permanent policy change than a temporary one. This fact creates an unavoidable difficulty for countercyclical fiscal policy. The appropriate policy may be to have an expansionary fiscal policy with large budget deficits during a recession, and then a contractionary fiscal policy with budget surpluses when the economy is growing well. But if both policies are explicitly temporary ones, they will have a less powerful effect than a permanent policy. When an economy recovers from a recession, it does not usually revert back to its exact earlier shape. Instead, the internal structure of the economy evolves and changes and this process can take time. For example, much of the economic growth of the mid-2000s was in the sectors of construction (especially of housing) and finance. However, when housing prices started falling in 2007 and the resulting financial crunch led into recession, both sectors contracted. The manufacturing sector of the U.S. economy has been losing jobs in recent years as well, under pressure from technological change and foreign competition. Many of the people thrown out of work from these sectors in the Great Recession of 2008–2009 will never return to the same jobs in the same sectors of the economy; instead, the economy will need to grow in new and different directions, as the following feature demonstrates. Fiscal policy can increase overall demand, but the process of structural economic change—the expansion of a new set of industries and the movement of workers to those industries—inevitably takes time. People can lose jobs for a variety of reasons: because of a recession, but also because of longer-run changes in the economy, such as new technology. Productivity improvements in auto manufacturing, for example, can reduce the number of workers needed, and eliminate these jobs in the long run. The Internet has created jobs but also caused the loss of jobs as well, from travel agents to book store clerks. Many of these jobs may never come back. Short-run fiscal policy to reduce unemployment can create jobs, but it cannot replace jobs that will never return. Fiscal and monetary policy can help an economy that is producing below its potential GDP to expand aggregate demand so that it produces closer to potential GDP, thus lowering unemployment. But policy cannot help an economy produce at an output level above potential GDP without causing inflation. At this point, unemployment becomes so low that workers become scarce and wages rise rapidly. A final problem for discretionary fiscal policy arises out of the difficulties of explaining to politicians how countercyclical fiscal policy that runs against the tide of the business cycle should work. Politicians often have a gut-level belief that when the economy and tax revenues slow down, it is time to hunker down, pinch pennies, and trim expenses. Countercyclical policy, however, says that when the economy has slowed down, it is time for the government to raise spending and cut taxes to offset spending declines in the other sectors of economy. Conversely, when economic times are good and tax revenues are rolling in, politicians often feel that it is time for tax cuts and new spending. But countercyclical policy says that this economic boom should be an appropriate time for keeping taxes high and restraining spending. Politicians tend to prefer expansionary fiscal policy over contractionary policy. There is rarely a shortage of proposals for tax cuts and spending increases, especially during recessions. However, politicians are less willing to hear the message that in good economic times, they should propose tax increases and spending limits. In the economic upswing of the late 1990s and early 2000s, for example, the U.S. GDP grew rapidly. Estimates from respected government economic forecasters like the nonpartisan Congressional Budget Office and the Office of Management and Budget stated that the GDP was above potential GDP, and that unemployment rates were unsustainably low. However, no mainstream politician took the lead in saying that the booming economic times might be an appropriate time for spending cuts or tax increases. Note that because the Fed is insulated from the political process, it is more willing to use contractionary policy when the economy is booming and inflation threatens to increase. Expansionary fiscal and monetary policy can help to end recessions and contractionary fiscal policy can help to reduce inflation. Given the uncertainties over interest rate effects, time lags, temporary and permanent policies, and unpredictable political behavior, many economists and knowledgeable policymakers had concluded by the mid-1990s that discretionary fiscal policy was a blunt instrument, more like a club than a scalpel. It might still make sense to use it in extreme economic situations, like an especially deep or long recession. For less extreme situations, it was often preferable to let fiscal policy work through the automatic stabilizers and focus on monetary policy to steer short-term countercyclical efforts.